The guardian of Asgard, Heimdall was the son of “Nine Waves”, which referred to the nine daughters of Aegir, god of the sea. As such, he had nine mothers, all of them sisters; his father in generally thought to have been Odin, although this was never quite clear. Variants of his name include Heimdalr and Heimdallr. He lived in his fortress Himinbjorg, which stood right beside the spot where the flaming rainbow bridge Bifrost connected the other realms to Asgard. As watchman, it was his duty to guard the gates of Asgard and prevent giants and other enemies from entering, and watch out for danger. He also kept watch for the beginning of Ragnarok, the end of the world in Norse mythology. Heimdall could hear the sound of grass and wool growing and see over a hundred miles into the distance, and he slept very little, making him extremely well-suited to his job as watchman and gatekeeper. He also had the gift of foresight,having sacrificed one of his ears to Mimir’s Well, much like Odin sacrificed his eye. Physically, he was described as big and very handsome, with golden teeth which were his most striking feature. He was also known for his dislike of Loki. As a watchman, he possessed a horn, the Gjallarhorn, which he would blow to signal the beginning of Ragnarok, calling the gods and their army to battle on the Vigrid plain. This horn could be heard in all the nine realms. He also owned a sword called Hofund, and a golden-maned horse called Gulltopp. 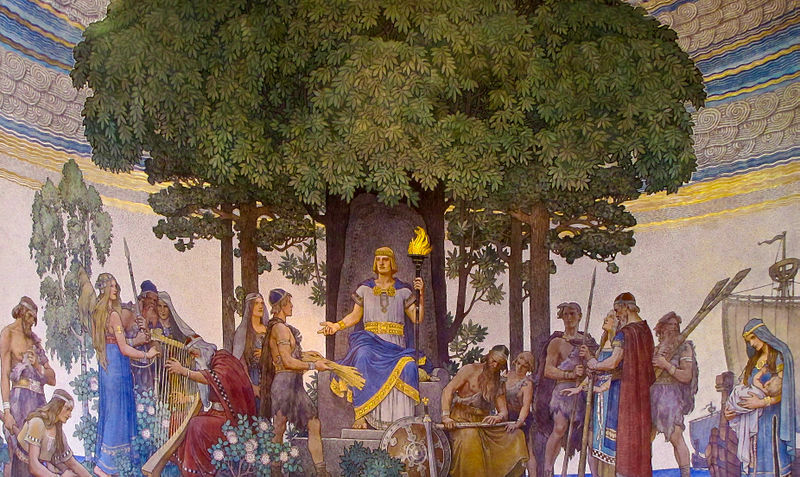 Heimdall’s other main role was in establishing the three social classes in Norse society. In the guise of a man named Rig, he traveled across Midgard and visited three houses–a shack, a farm house, and a castle. He stayed a night in each, and fathered three sons with three “grandmothers” who lived there. Jarl, a handsome young man, later married awoman called Erna, and they became the ancestors of the noble class. Karl, a sturdy, capable man, married a woman and had many children with her, becoming the ancestor of all farmers or peasants. Thrall, an ill-favored laborer, became the ancestor of the slaves, the lowest social class. Heimdall was a dutiful, disciplined god, guarding Asgard and imposing and keeping order. In one version of the tale of how Loki stole Freyja’s necklace, the Brisingamen, it was Heimdall who saw the theft with his sharp eyes. He pursued Loki, caught him and fought him, recovering the precious necklace and returning it to Freyja. 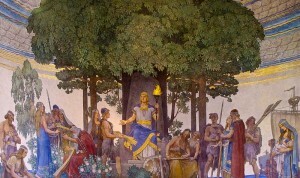 However, in another version, Loki was actually acting under Odin’s orders, and Odin himself returned the necklace to Freyja. Like the other gods, Heimdall was also a warrior and would fight in the final battle when Ragnarok began. He was destined to be among the last to fall, and his long rivalry with Loki would come to a head and finally be resolved, as the two were foretold to kill each other in that final duel.